You are currently browsing the tag archive for the ‘collaboration’ tag. 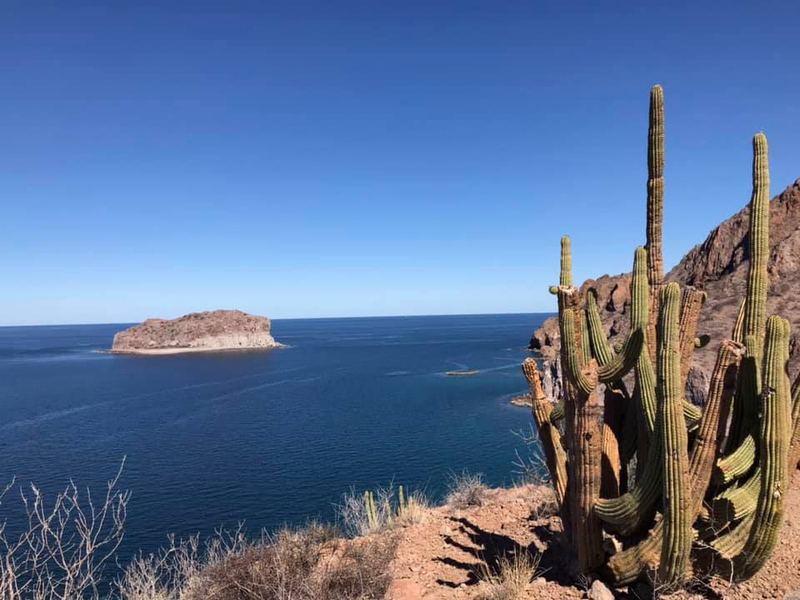 Here are some previous posts with photos from Jan. 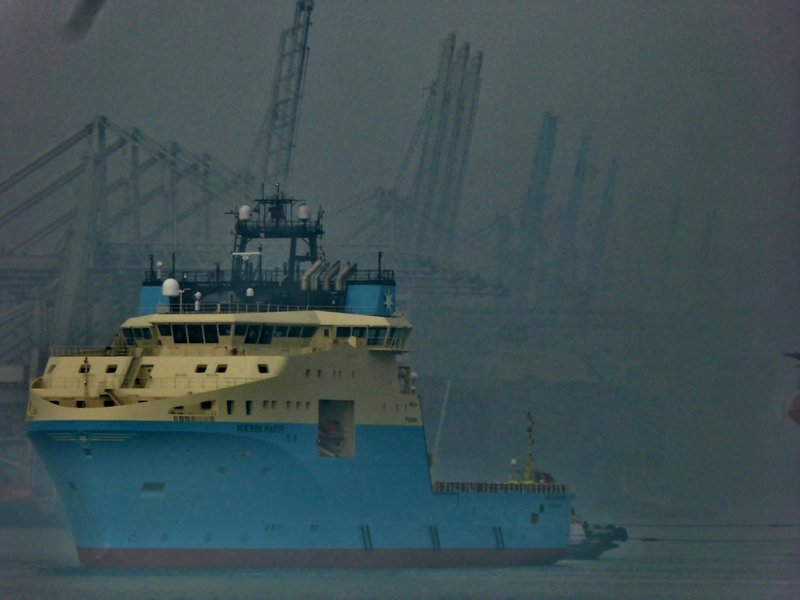 So here’s the tugboat, just out of the shipyard near the Arctic Circle and at work, the last in a series of five identical anchor handling tug supply (AHTS) vessels bringing more than 23000 hp to the job. This job starts in the Princess Arianehaven. 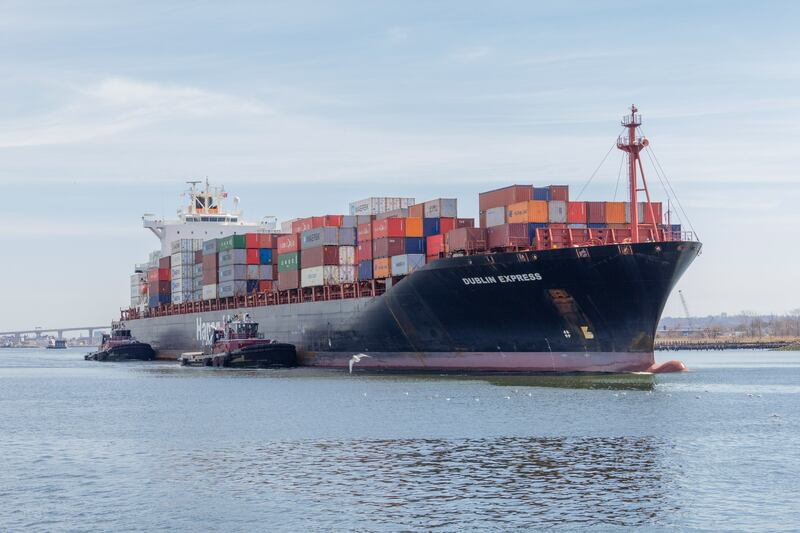 And how many tugs does it take? Here’s Maker assisted by Mutratug 32, quite interesting in her own right as a Carrousel RAVE tug. Click here for more. But I digress. 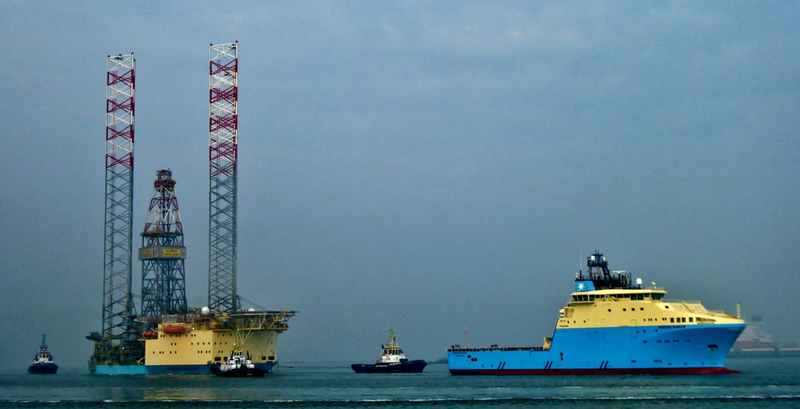 Maersk Resilient (2008) is moving out to the Stella Oil/Gas Field with this assistance. 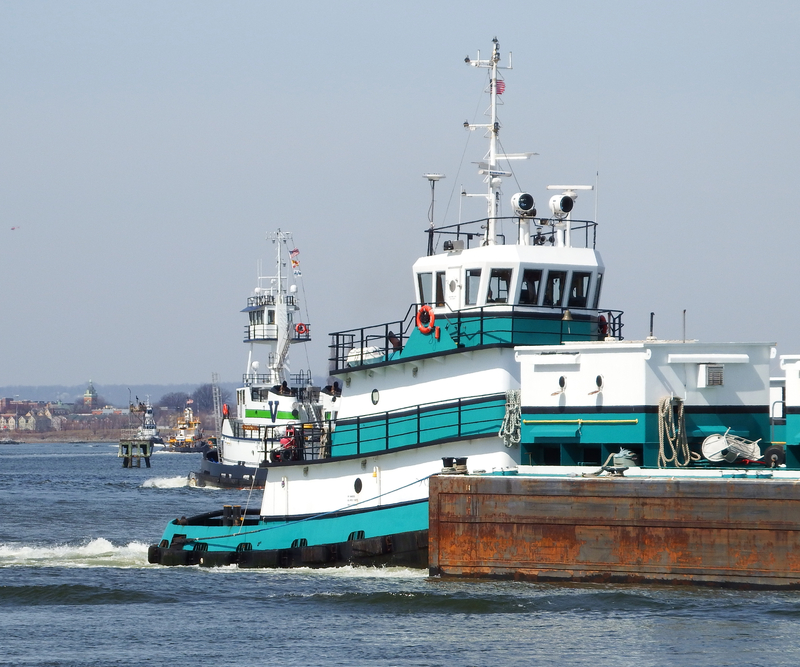 The additional tugs are Multratug 5 and FairPlay 27 and 28. And here Bugsier 3 intrudes on the scene. All photos taken last weekend by Jan Oosterboer and delivered via Jan van der Doe. 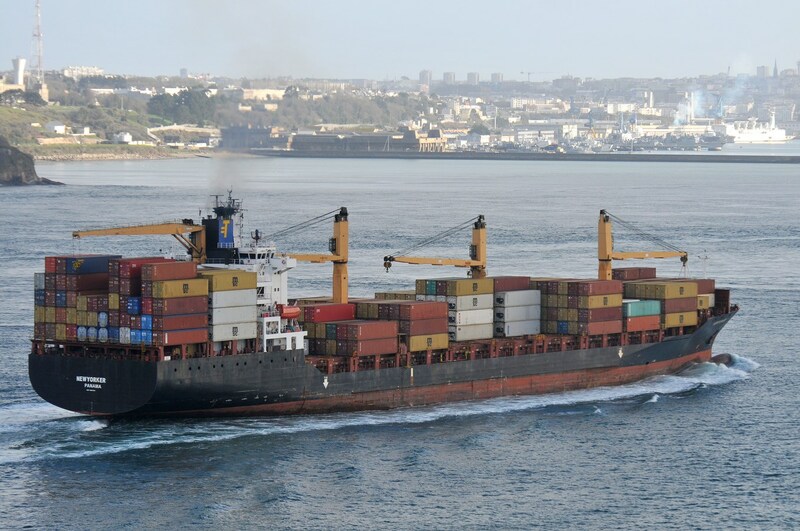 You also have one more day to name the port and guess the date in yesterday’s post. For some of you this will be very easy. Where was this photo taken and approximately what date? Photo was taken by Allan Seymour. He sent more, which I’ll post on another day. Previously I’ve done a series called ports of [the world], which I’m always looking to add to if you wish to collaborate. Also, coming up soon, a tugboat rated at 23,000 hp . . . what would that look like? 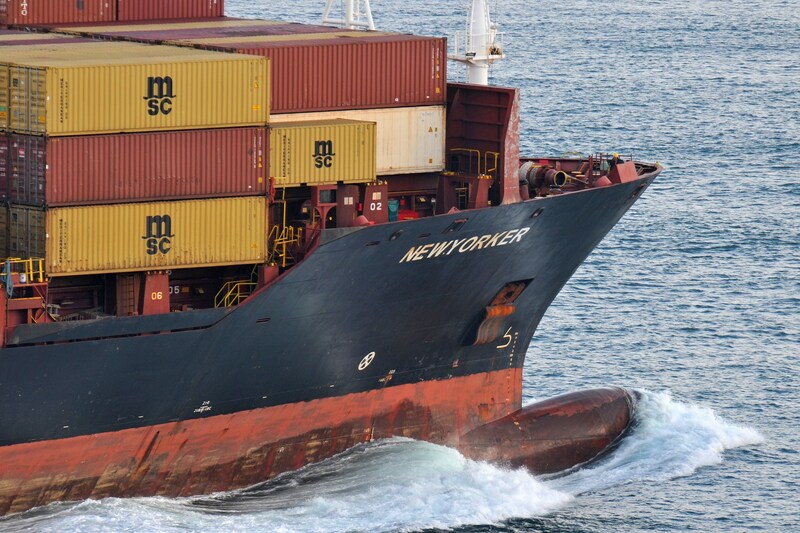 And I wondered about the unusual pyramidal arrangement of containers on the stern. I hadn’t known that Gary Haszko, credited for the next two photos, was taking photos almost simultaneously from Elizabethport, and aware of something else. 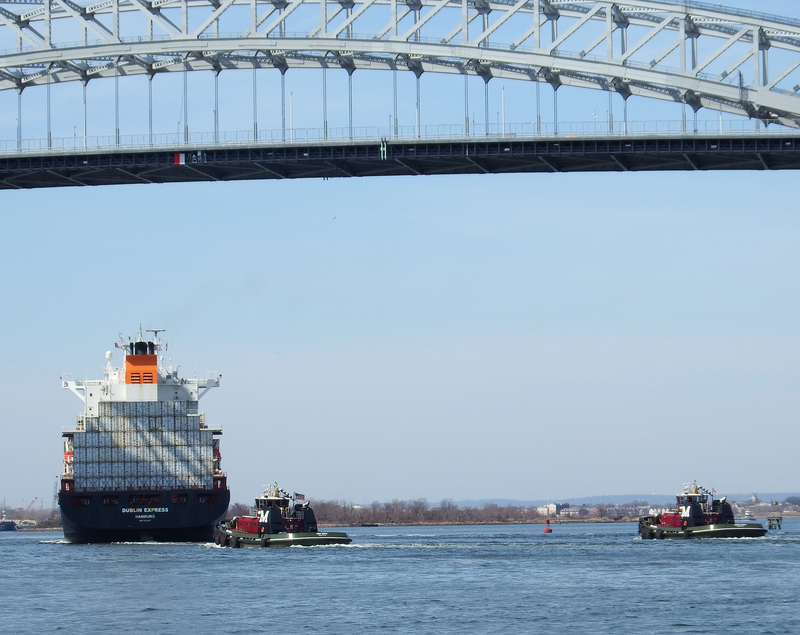 Here the two tugs assist in pinning Dex to the pierced in Howland Hook. He also knew something else I was unaware of, ie, containers tumbling overboard during a rough ocean transit may have damaged the hull and led to oil spilling into the Kills. 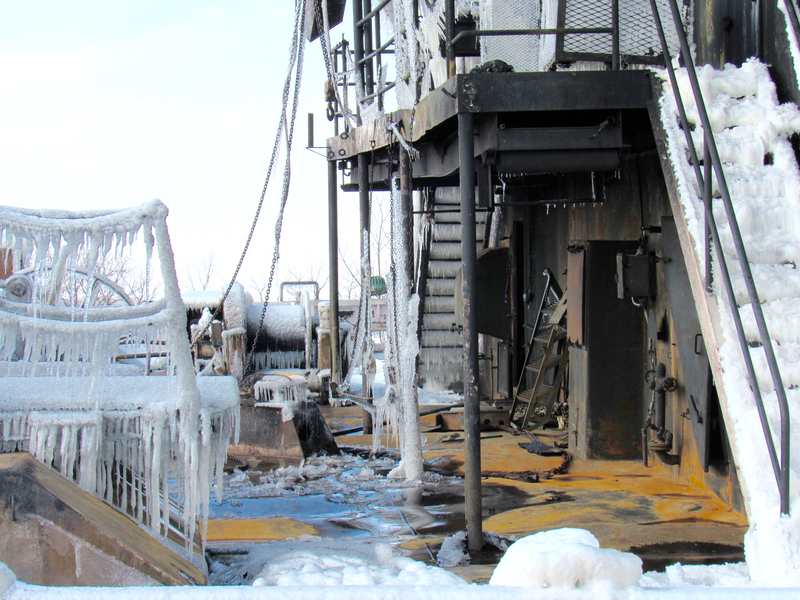 For more on this spill, click here. 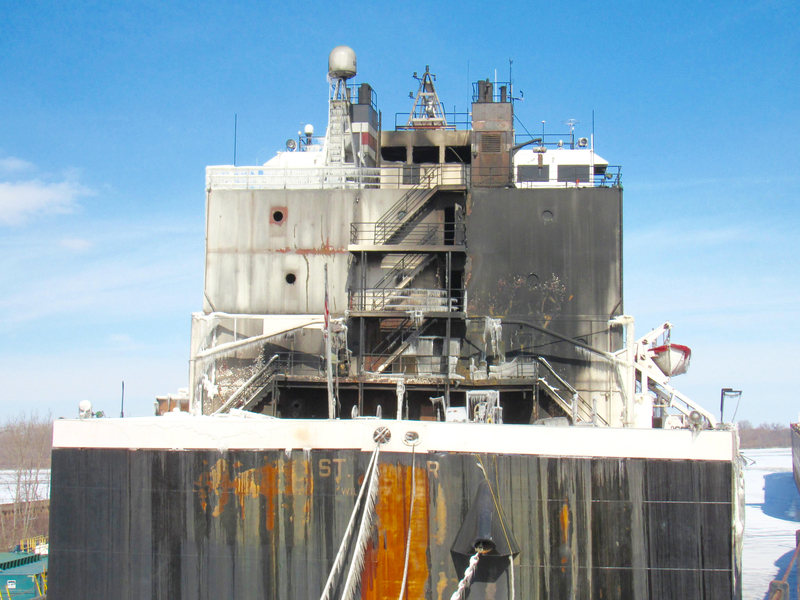 After a concerted investigation and clean up effort, USCG cleared the ship to depart. Many thanks to Gary for use of the last two photos above; all others by Will Van Dorp. Quick . .. name the ship name the ONE vessel . . . The first three photos were taken Sunday by Bjoern of the New York Media Boat. 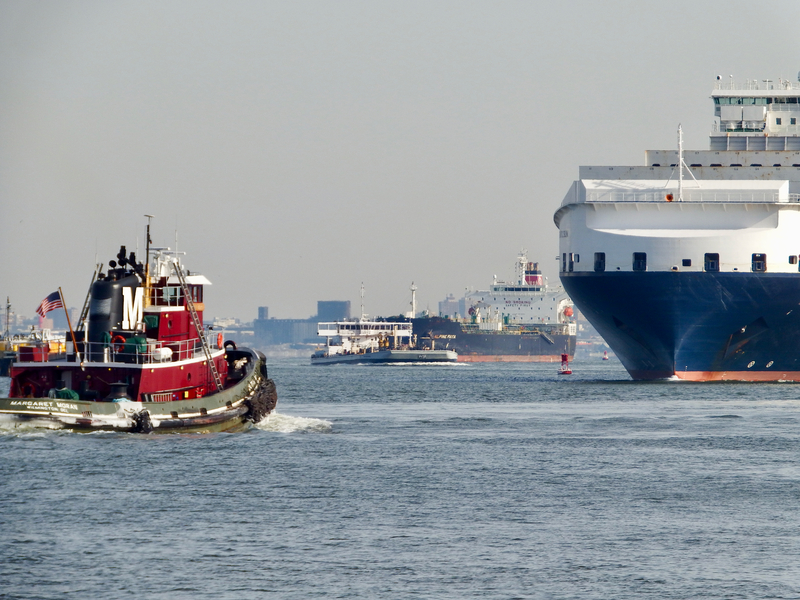 And if you know the tugs in the sixth boro you have a 75% chance of naming all tugs here too . 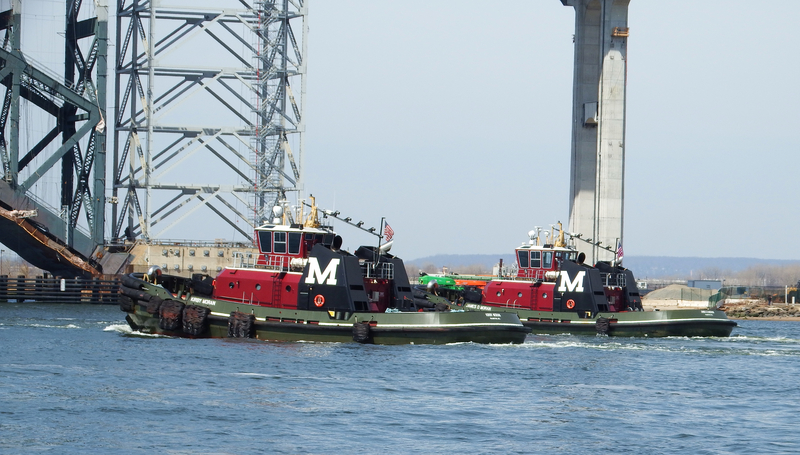 . . three of the four 6000 hp tugs by Moran. 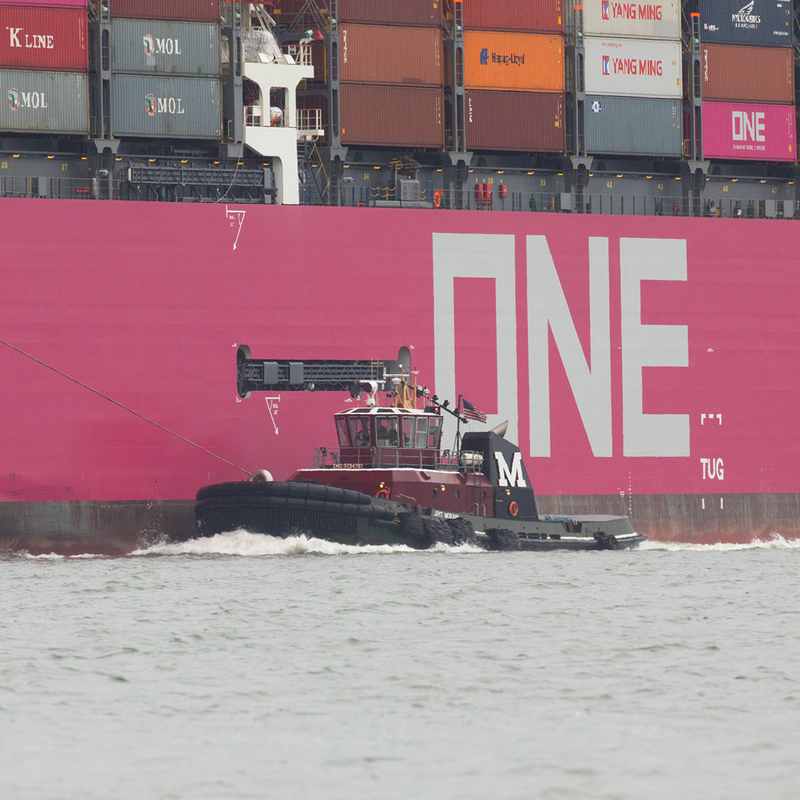 I’m not first in pointing out how small the tugs look relative to the 1200′ ONE Stork. I hope you guessed that right. The tugs are JRT, James D, Jonathan, and then Margaret farther back. While we’re on names . 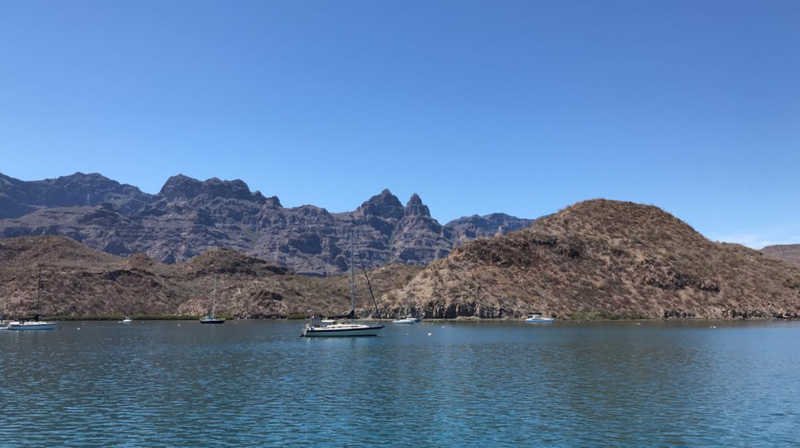 . . Glenn Raymo caught this photo upriver. Dodo . . . First ONE Stork and then Dodo. 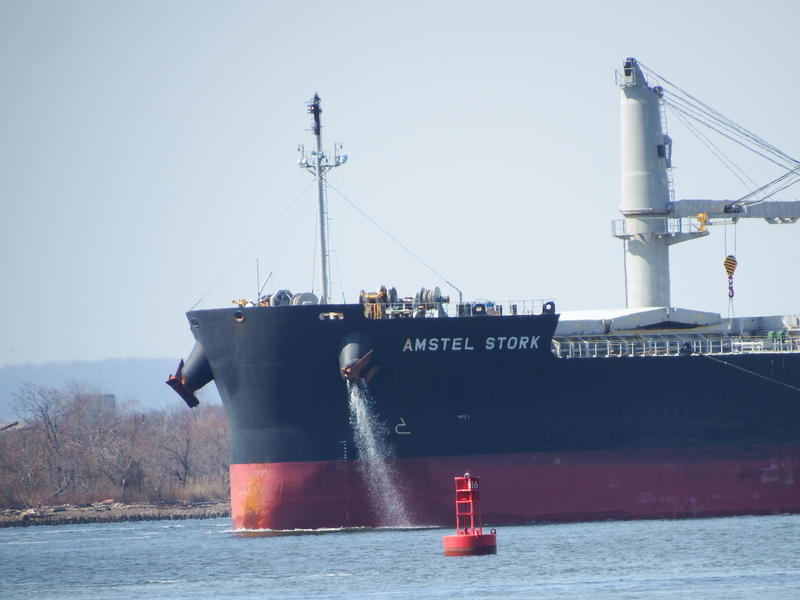 Over by Shooters Island the other day, I caught Amstel Stork, coming from Port Newark and headed upriver herself. 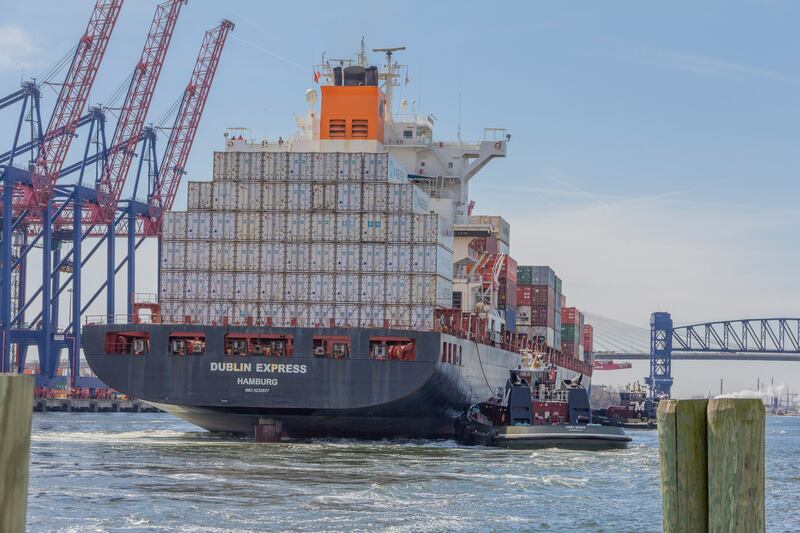 Jonathan and Miriam assist her around Bergen Point, but here’s my point: two vessels named “stork” in the harbor the same week!!? What going on? And with Dutch as my first language, I read this as Ooievaar van Amsted . . . that big bird name being ooievaar in Dutch. 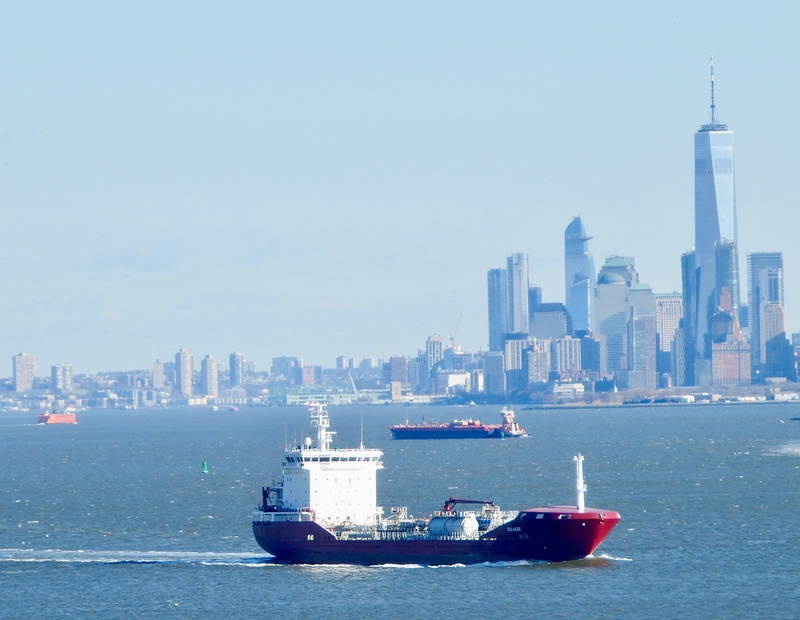 Recently, vessels with the following names have visited the sixth boro: NYK Blue Jay Southern Owl Stena Penguin … See what I mean about a trend that has emerged? A few years back I saw the Eagle fleet, eg in yesterday’s post, and separate from that . . . Asphalt Eagle. A few years back I saw a Peacock. 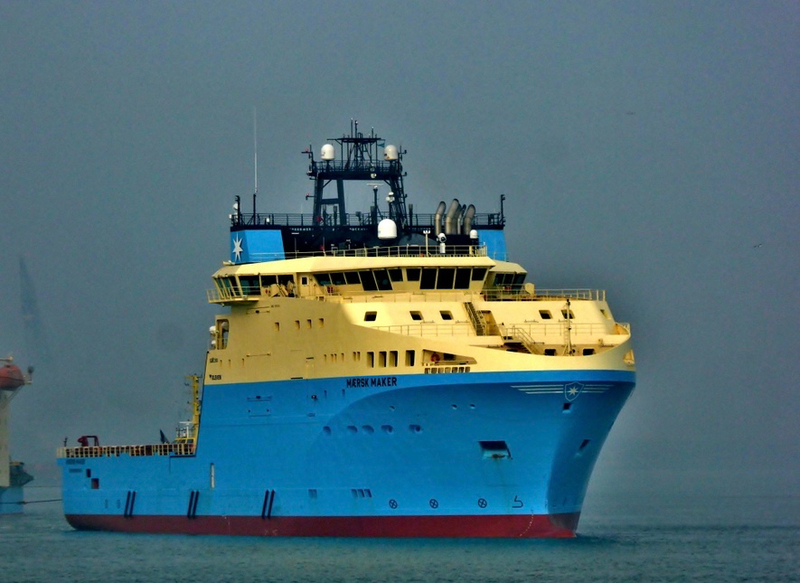 Here are some I suppose I’ll never see: Subsea Seven has some bird vessels, esp in diving support. Millennium Falcon…. oh wait, that might not have launched yet . . . Magic Victoria was here recently, although my photo was too blurry to use here. Surfer Rosa . . . that name of the many I’ve posted here will stick with me. As of this morning, Surfer Rosa is westbound in the Med just outside Algerian waters. Many thanks to Bjoern and Glenn for use of their photos. 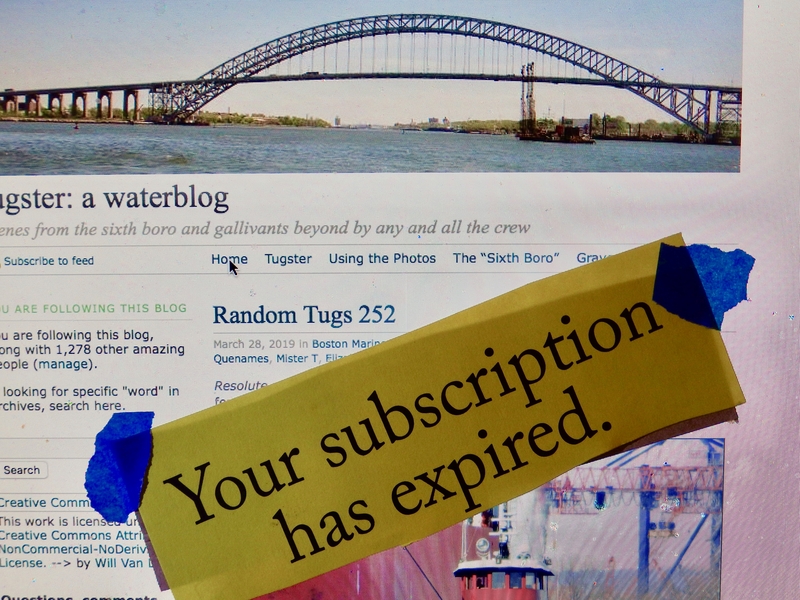 Well, maybe your subscription to something has expired, but reading tugster requires no subscription, and no lucre flows into tugster tower from your –I hope–daily habit of checking in here. It is April first, and I quite like the day. Here was what I did April 1, 2010, and here . . . . the day in 2009. I don’t always mark it, although once I shifted focus of the blog entirely to trucks, the first time. That generated a bit of hate mail . . . which led to a whole new division of tugster, i.e., trickster. which autocorrect always wants to spell incorrectly. Truckster it is. Since you’re here, let me share some miscellaneous photos. 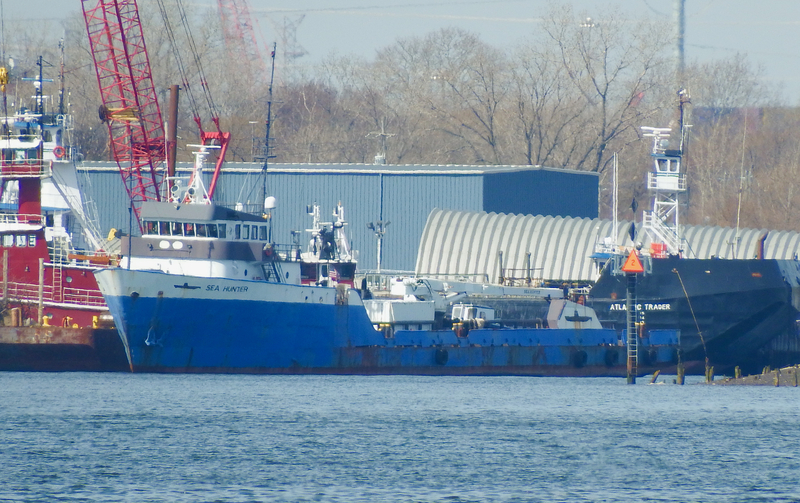 Sea Hunter has recently turned up near the McAllister yard. I posted my photos of Sea Hunter as she appeared in Boston three years ago here. Anyone know what fate she’s hunting for in the sixth boro? 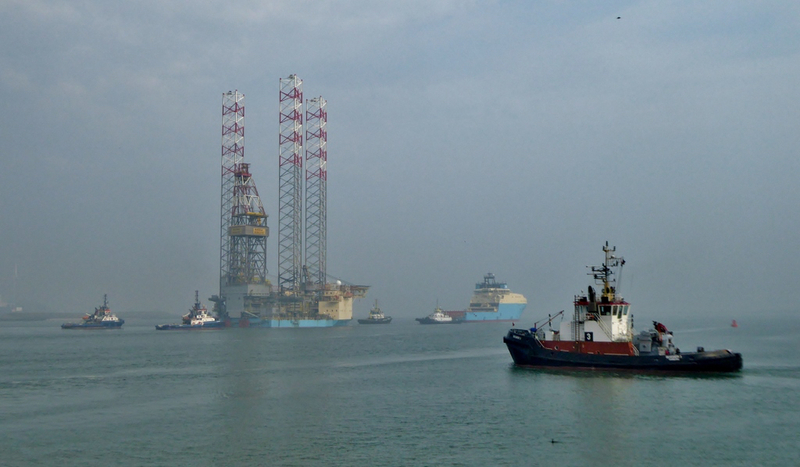 Also, on the photo below, there’s the Atlantic Trader barge. That’s the short-sea shipping hull I last saw in 2015 here. 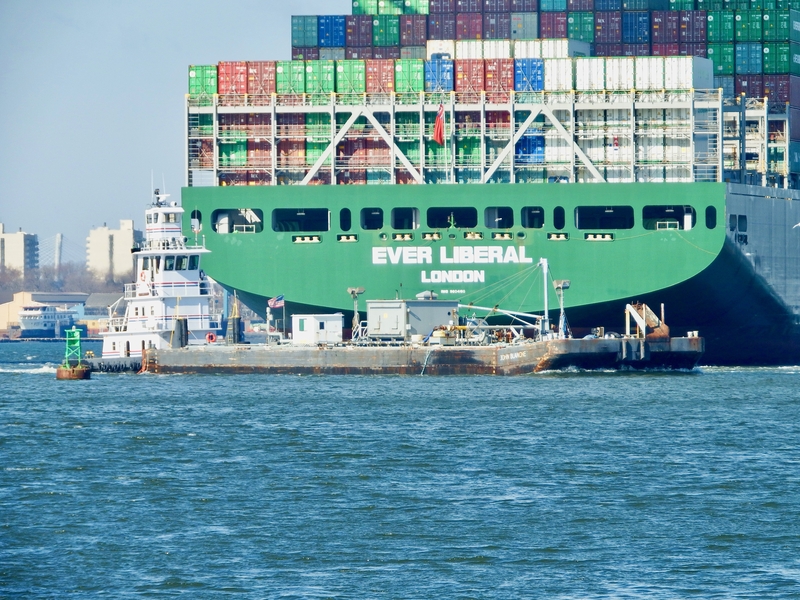 Here’s a dense shot: near to far, the far tugs are Crystal Cutler, Jacksonville, Navigator, and another unidentified Vane tugboat. So while I’m at it, let me share some mail. 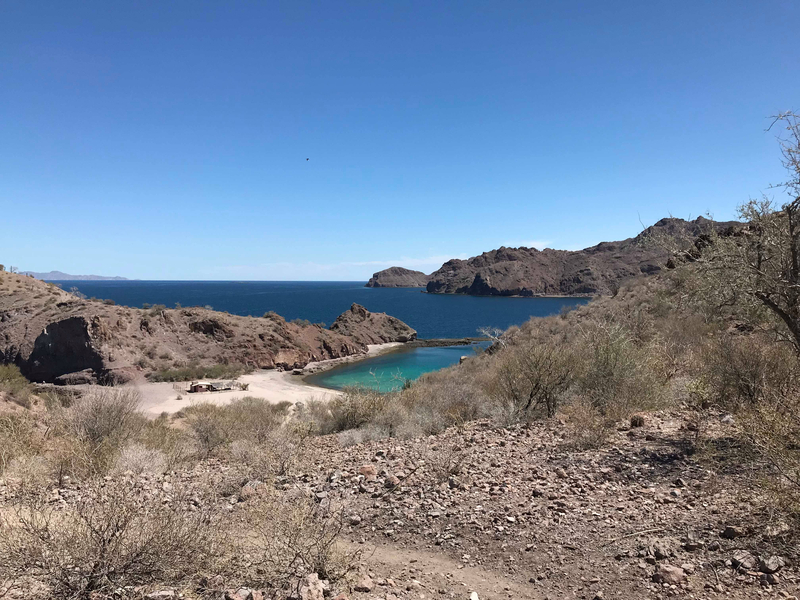 From Phil Gilson, an article about fast US Navy vessels converted into shallow draft speedy banana boats, and that’s no April Fools joke. See it here. And finally here’s an oldie-but-goodie from Steve Munoz. Jane McAllister (1968) and Margaret M McAllister (1928, converted from steam to diesel in 1957) assist a Sealand ship in Port Elizabeth back in 1986. Note the Old Bay Draw is still bissecting Newark Bay in that shot. Thanks to Phil for the story/link and Steve for the photo. The other photos by Will Van Dorp, and inscribed in tugster tower by invisible watermarks. 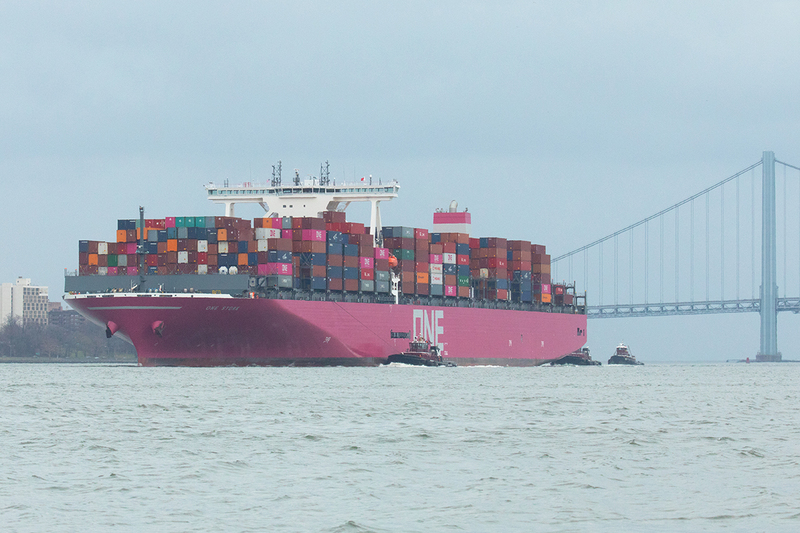 Let’s try a variation: I’ve random tugs and random ships, in which I’ve confined most pics to a single general location and a a single photographer . . . me. 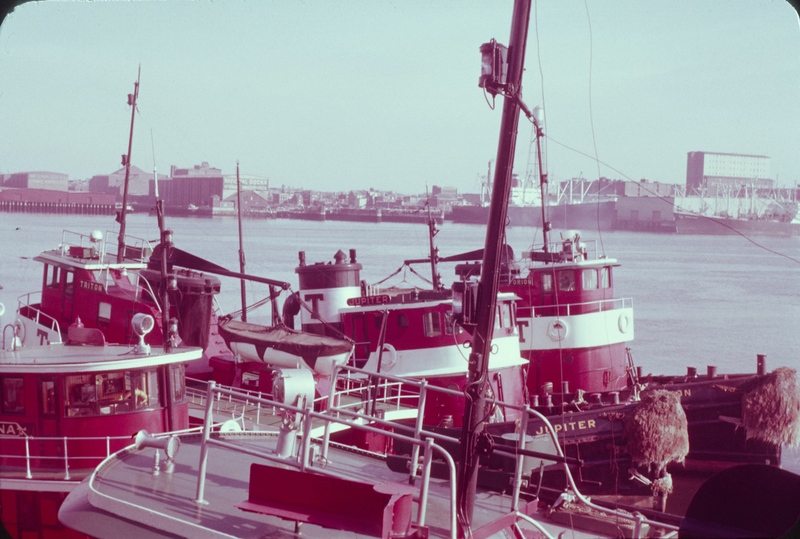 “Really random tugs” combines locations, eras, and photographers. So why not do the same with ships, although in this case I’ve taken almost all the photos but in a variety of locations and times. But this first one launches the concept. What can you surmise or identify about the photo below, not taken by me? Answer at the end of this post. 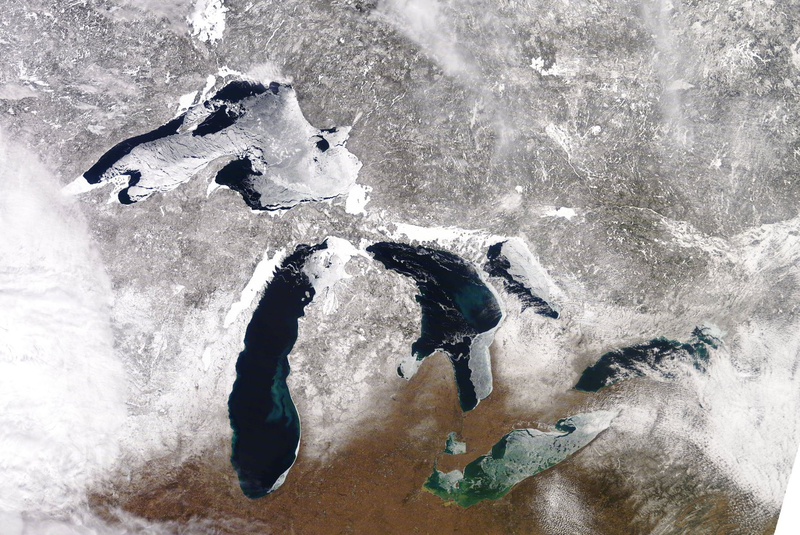 Spring brings the Great Lakes back to life. 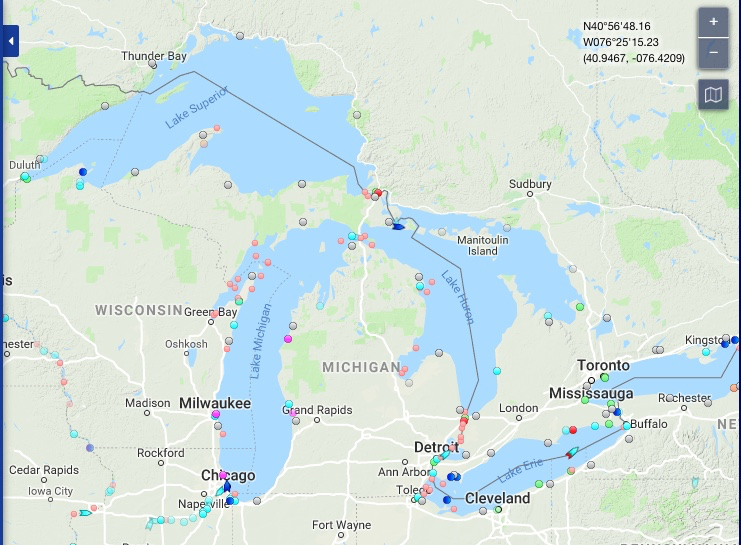 Here is a March 11 AIS capture of traffic on the Lakes. The “arrows” are US and Canadian CG doing ice ops. The rivers system around Chicago has some traffic. The NOAA satellite image below provides the explanation . . . what looks ice covered IS. 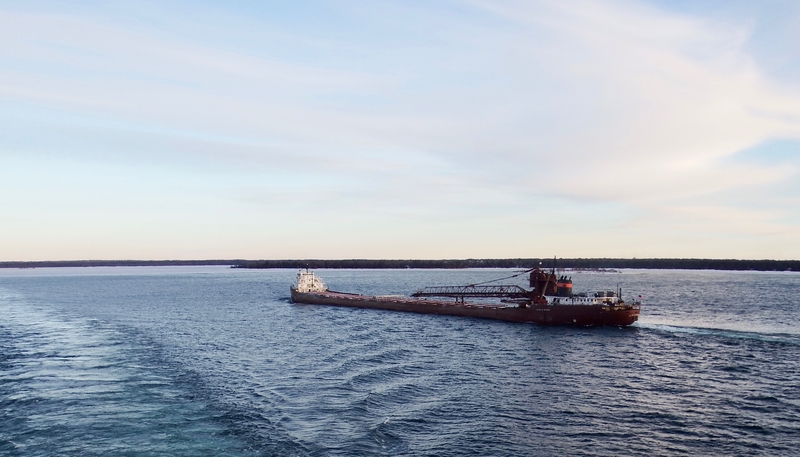 With the Soo scheduled to open on Monday, March 25, icebreaking carries high priority. Note Green Bay as well. March 22 marked the opening of the Welland Canal. 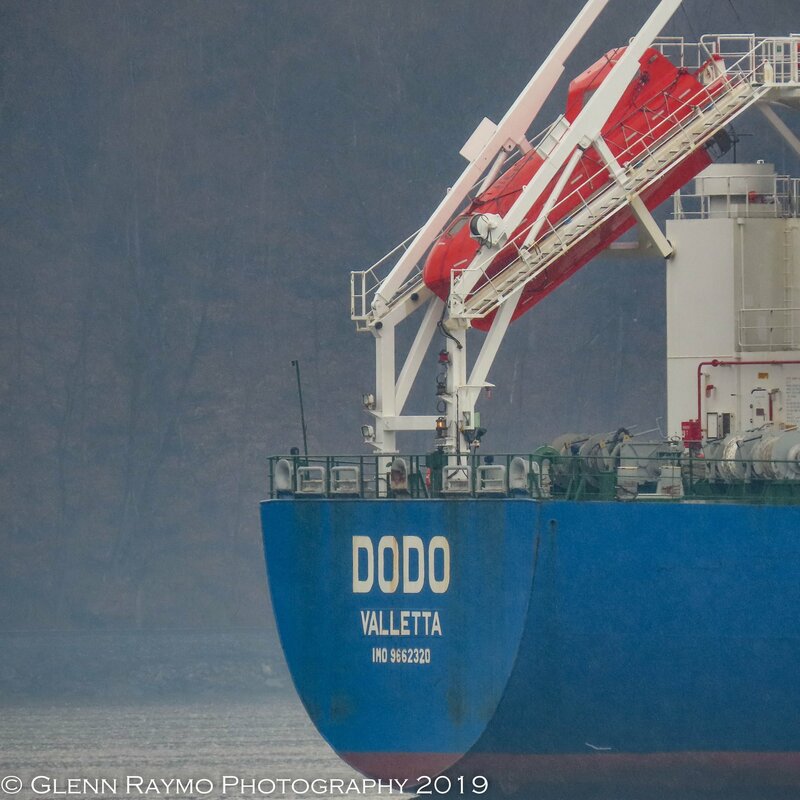 The first upbound ship this year was Thunder Bay; this photo I took in Quebec in October 2017. The first down bounder through the Welland was Algoma Spirit, but I’ve never gotten a photo of her. 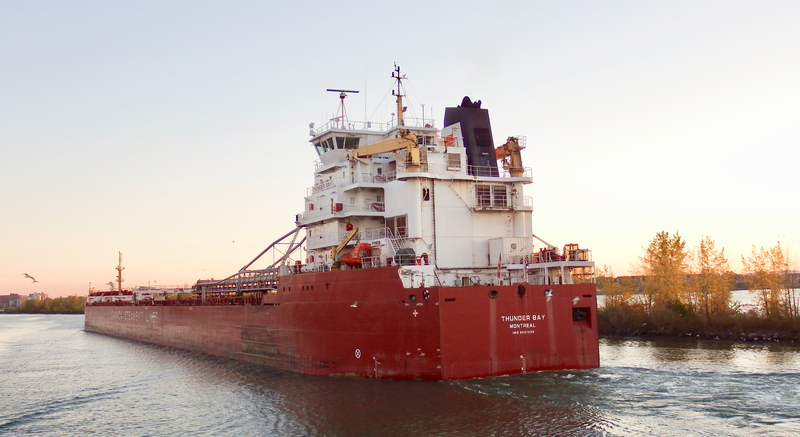 Kaye E. Barker was the first springtime vessel out of Duluth; I took this photo in the last week of navigation before the Soo closed on January 15. 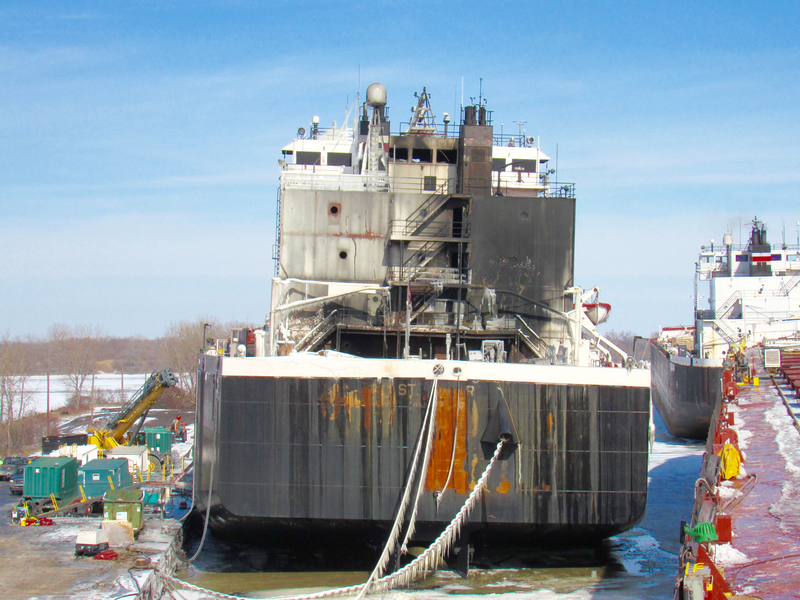 The Soo is scheduled to open on Monday, March 25. The KVK is a busy place all year round, although it’s not uniformly busy. 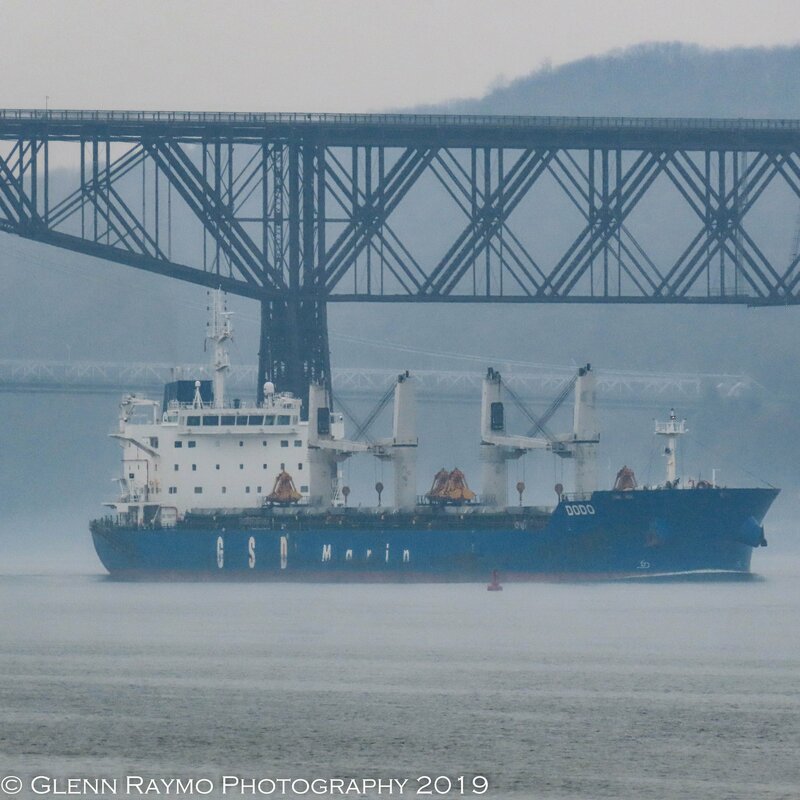 On this day last month, Alpine Maya followed Port Richmond, which followed Atlantic Sun. 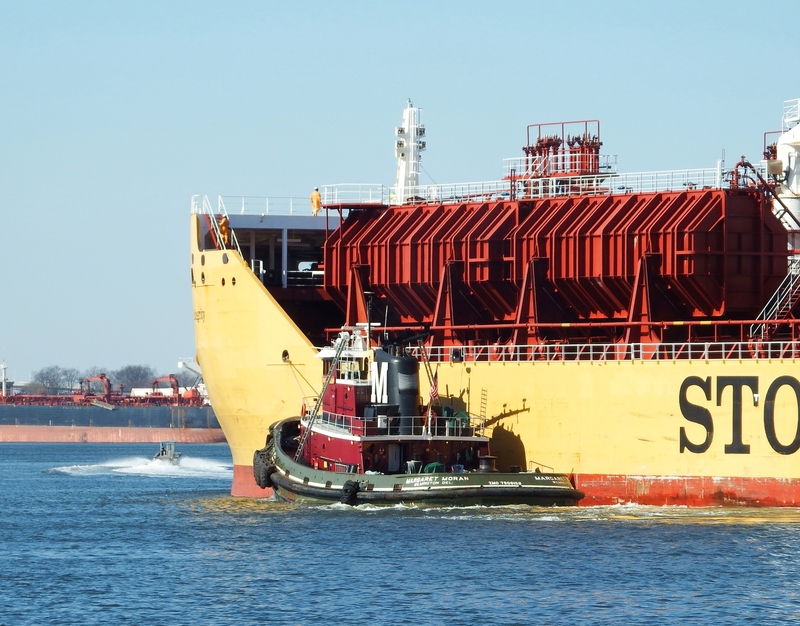 Stolt Integrity here stemmed while waiting to replace the tanker in the distance to leave the berth. Tankers come in a variety of sizes; Selasse is a particular small one. By now, have you figured out that first photo? 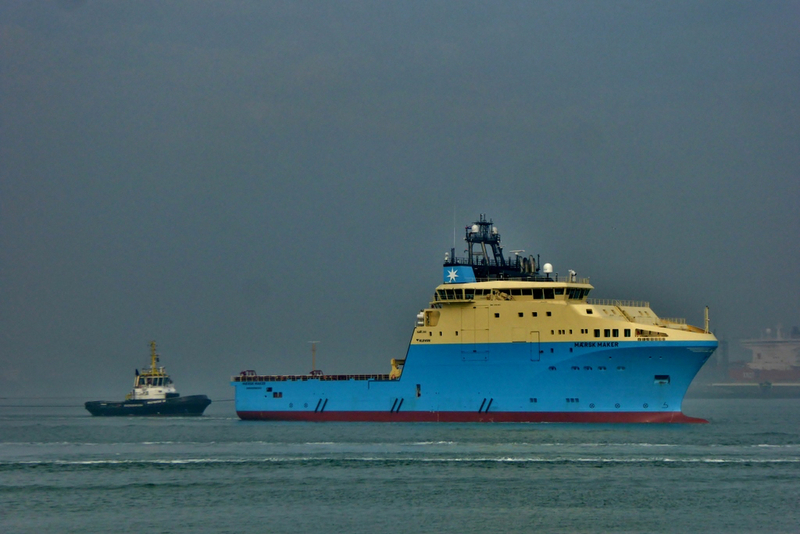 I’ll give you a clue: vessel name is Nggapulu and as of last night she was in BauBau. Traffic moves at all hours; night photos turn out quite unsatisfying, but golden hour ones I enjoy. 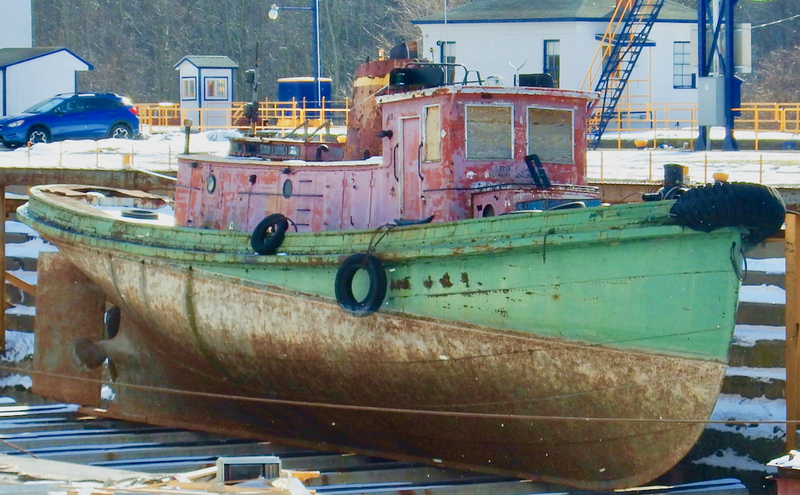 Can you guess the hull color on this one? Foreshortening belies the amount of distance actually between the stern of the Evergreen ship and Diane B/John Blanche. 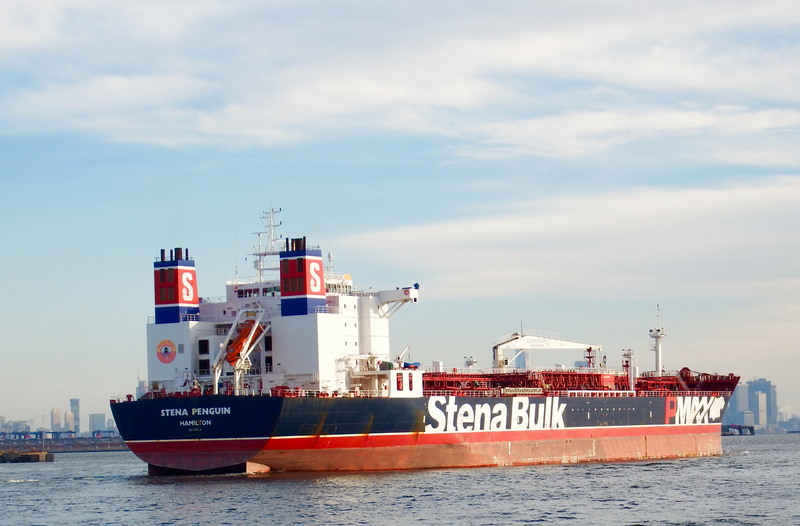 The colorful Stena tankers, bears and all, seem to appear mostly in winter. So here you have the answer, sort of. 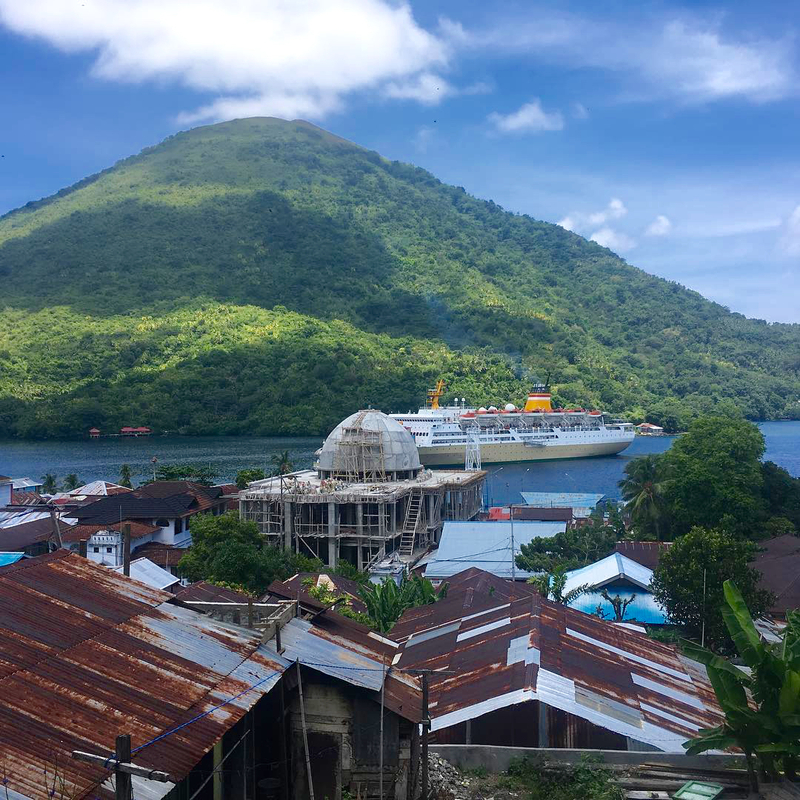 Indonesia, being a far-flung archipelago supports a ferry system called Pelni, an acronym. As an example of distances here, find Jakarta lower left. From there to Makassar roughly in the center is 1000 miles! Pelni operates about two dozen ferries of various designs. Ngga Pulu has classic lines and was launched in 2002. 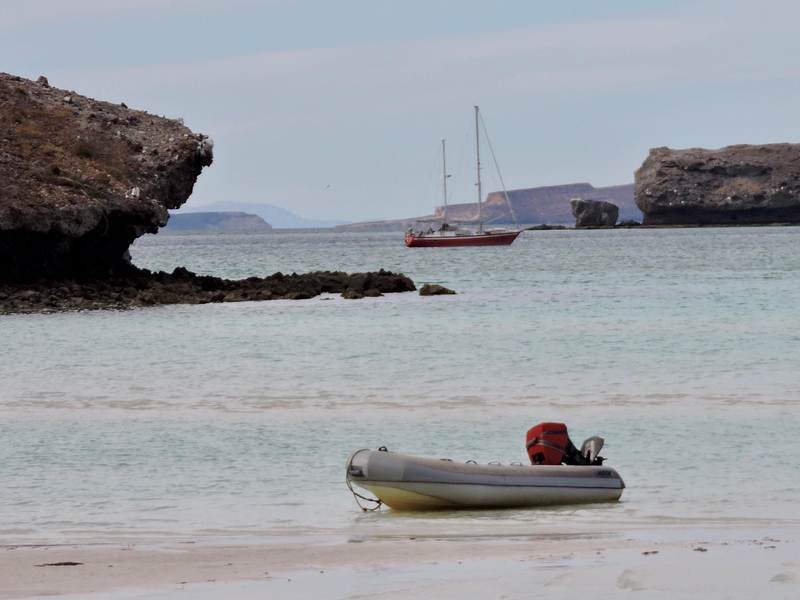 Here’s an English language site about traveling the archipelago. Restless? Aye peri! Many thanks to Hannah Miller for sharing the photo of Ngga Pulu. I’m not sure how that’s pronounced, but it’s named for a mountain. Learning about Pelni and seeing this map gives me a whole new appreciation of Dewaruci. Let’s leave this as a mystery location for now. It’s on a list I have for the next year . . .
Here’s the landing craft . . . Ashore all magnitude of stark beauty awaits. 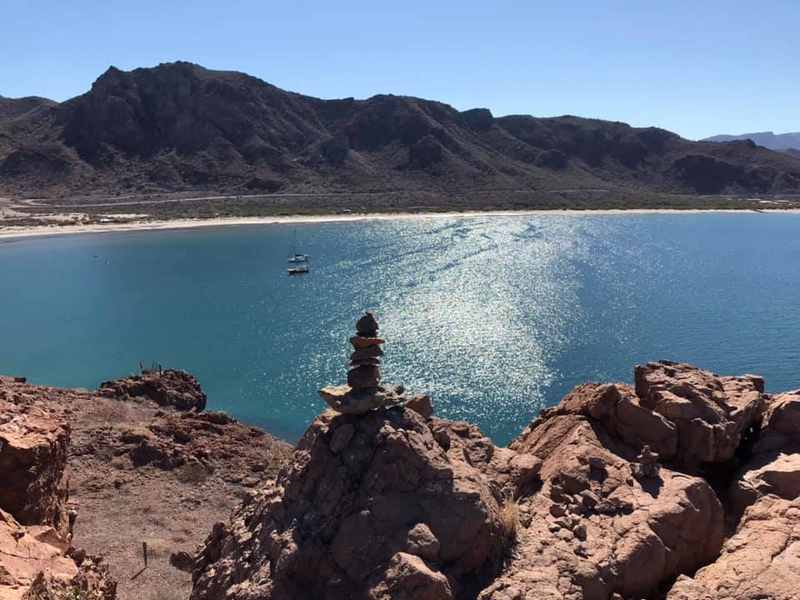 Follow the cairns to stay on the trail. 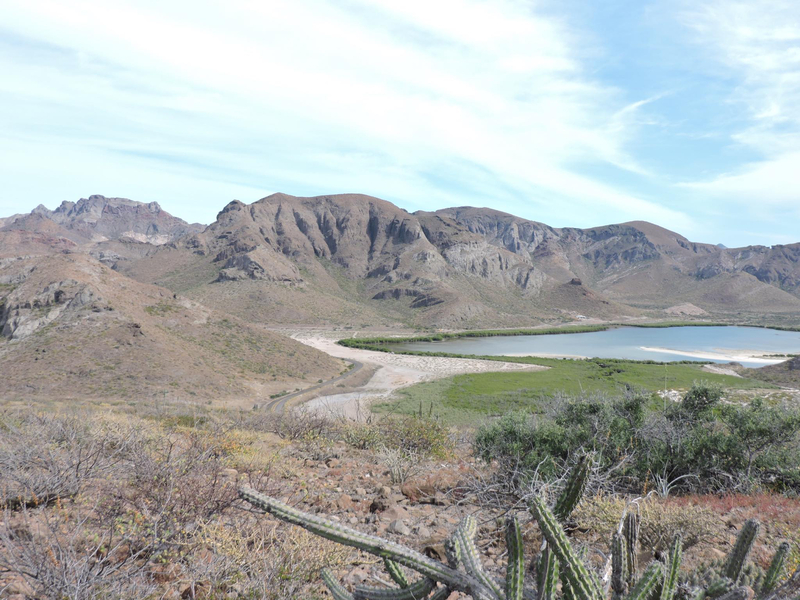 were taken from the trail to Steinbeck Canyon. All photos from anonymous gallivanters for now. Conjecture is welcome with the huge clue I gave you. Photos will be forthcoming in this post; I’m just using unusual formatting deliberately. Ponder this: what association do you have with the phrase “new yorker”, not “new york or ny”? There are no right or wrong answers here. I repeat . . .. just what association comes first to mind when you hear or read the phrase “new yorker”? I’ll bet you did not expect this. Many thanks to Xtian Herrou, frequent contributor on this blog . . . he sent these photos along yesterday, taken in Brest, in NE France. 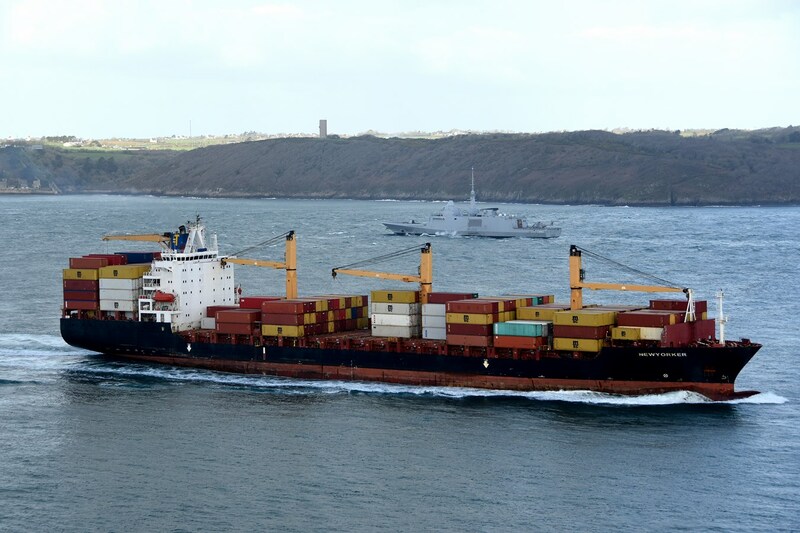 Technically, the name is Newyorker, and she’s currently approaching LeHavre from Brest. I’ biased of course, but it warms my heart to see this, although I must admit that my association involves a magazine famous for its nonfiction and cartoons. In fact, an image from that magazine has appeared on this blog here (scroll) and here. By the way, in that second link, tugster himself is holding the tooth–not of a mammoth but–of a suction dredge cutterhead, and if anyone wants to claim that 35-pound tooth, I’d be happy to pass it on. Many thanks to Xtian for these photos. 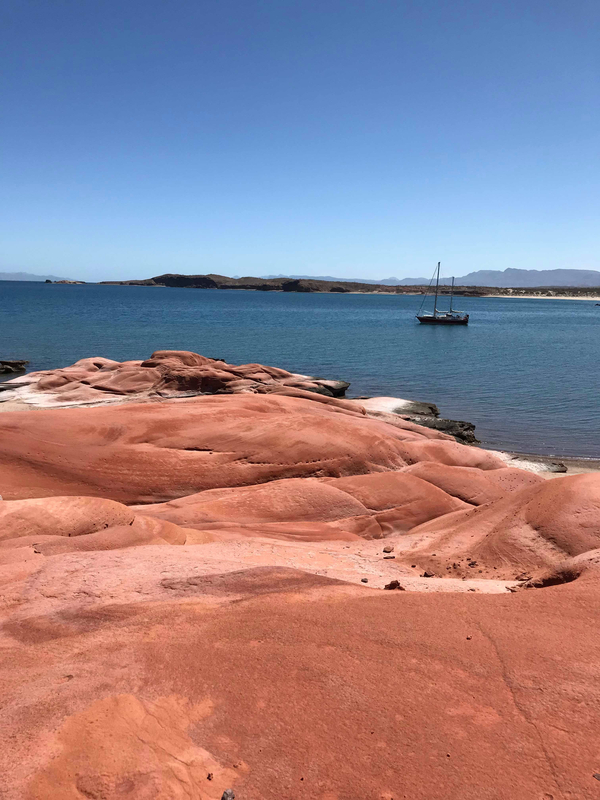 Many thanks to Lee Rust for working with the two photos immediately below, showing a boat frequently featured here. Photo to the left was taken near the elevators in Manitowoc in a slip now filled in and frequently piled high with coal adjacent to Badger‘s slip. 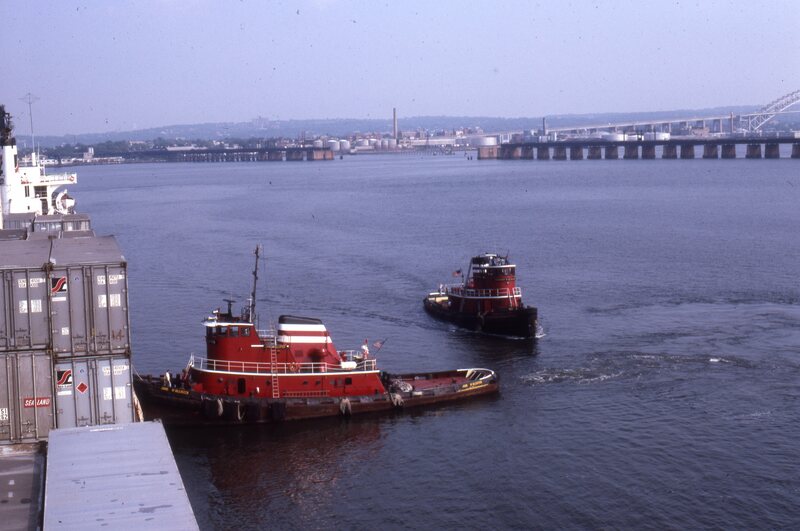 In the 1959 photo, the tug was owned by C. Reiss Coal Company. 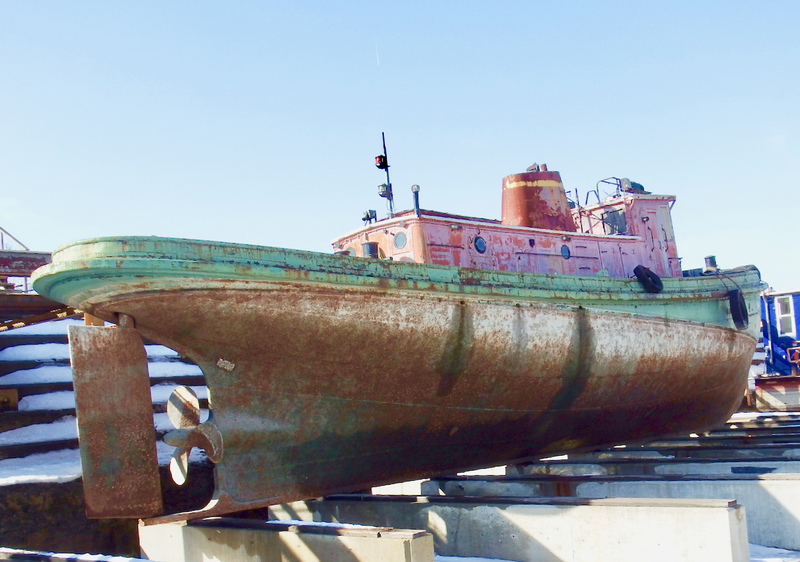 The tug had recently been repainted and repowered (1957). 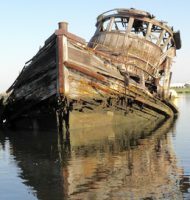 Badger gets regular maintenance, so a similar treatment of that vessel would not evoke the same emotions. Technically, the two photos above were 58 years apart, so I added the two below which I took in Lyons NY earlier in 2019; hence, six decades apart. Thanks to Lee and Jeff for providing these photos. 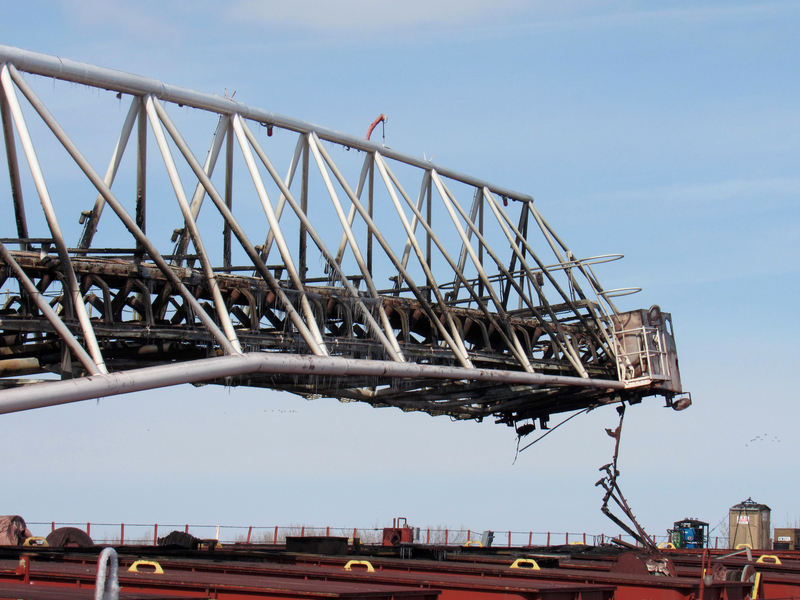 Unrelated: Check out freighterfreak’s photos from Duluth here. Anyone have similar juxtapositions of a single vessel or vehicle across time, please send it in. 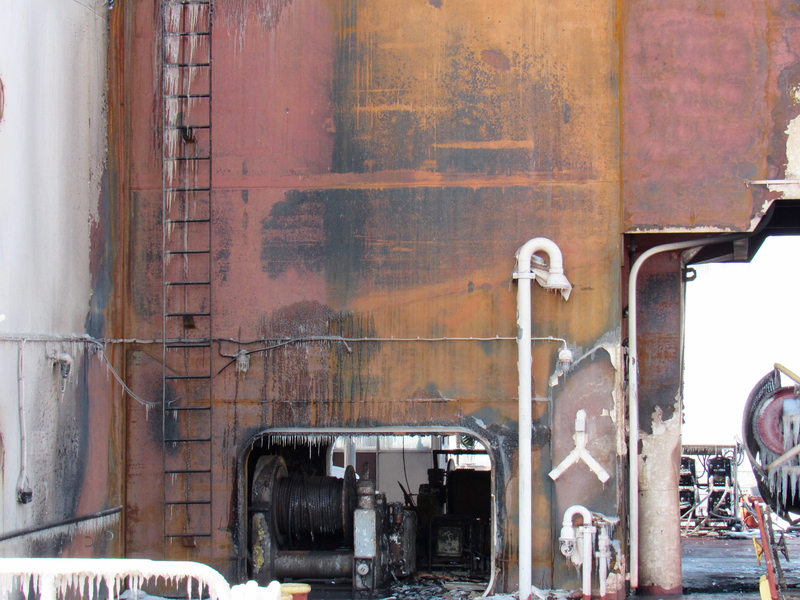 If you haven’t heard, a serious fire broke out on St. Clair last Saturday night in Toledo, OH, actually the eastern industrial suburb called Oregon, where a number of lakers are in winter layup at the CSX Torco dock. Torco expands to (TOledo ORe railroad COmpany). These photos were taken Monday or Tuesday, to the best of my knowledge, by Corey Hammond, a friend of a friend. 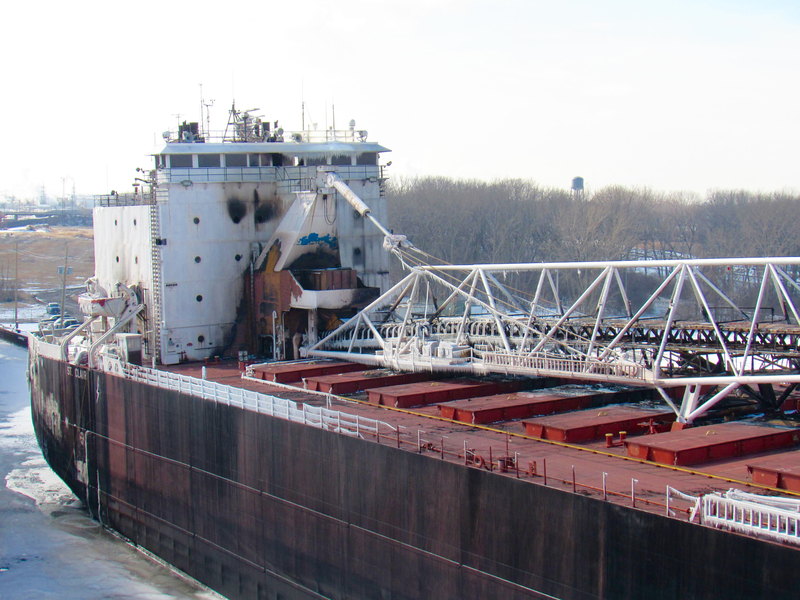 Some basic facts: St. Clair is a 760′ ore boat operating for American Steamship Company, or ASC, launched in Sturgeon Bay WI in 1975. 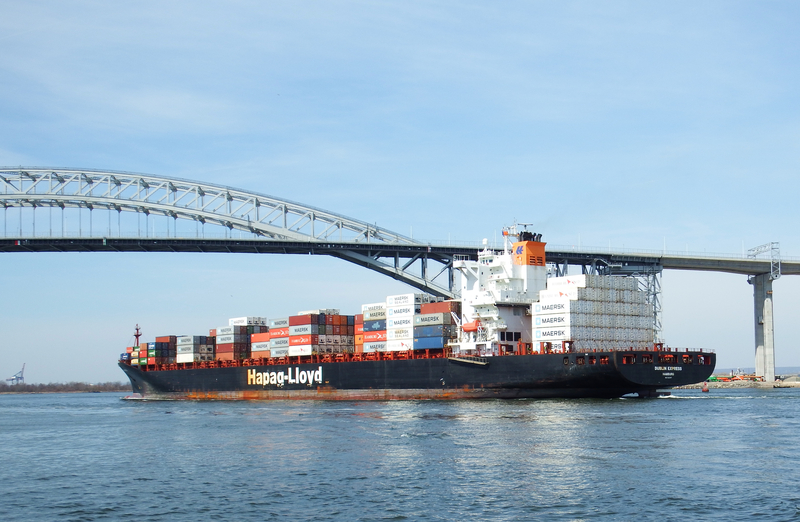 She transported diverse cargo with a capacity of 44,000 tons. 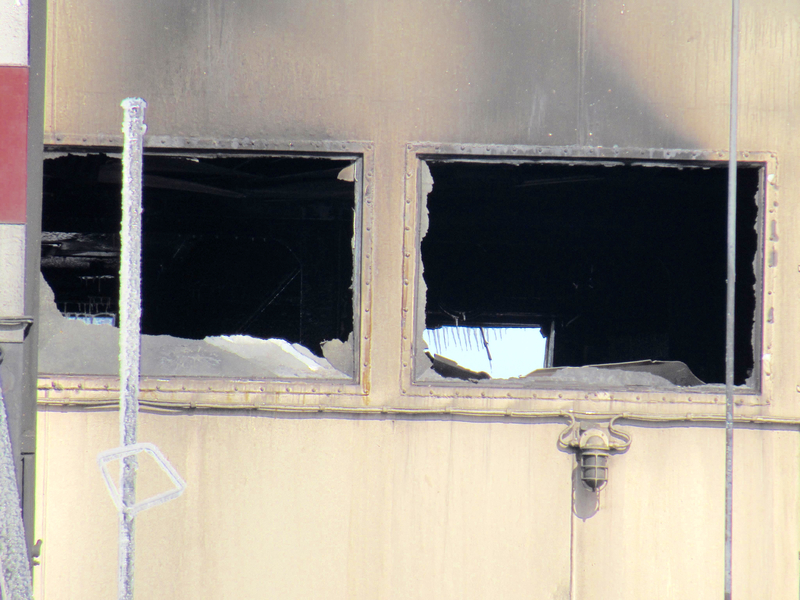 It appears the fire is now out, but investigation has possibly only just begun. No one was injured. 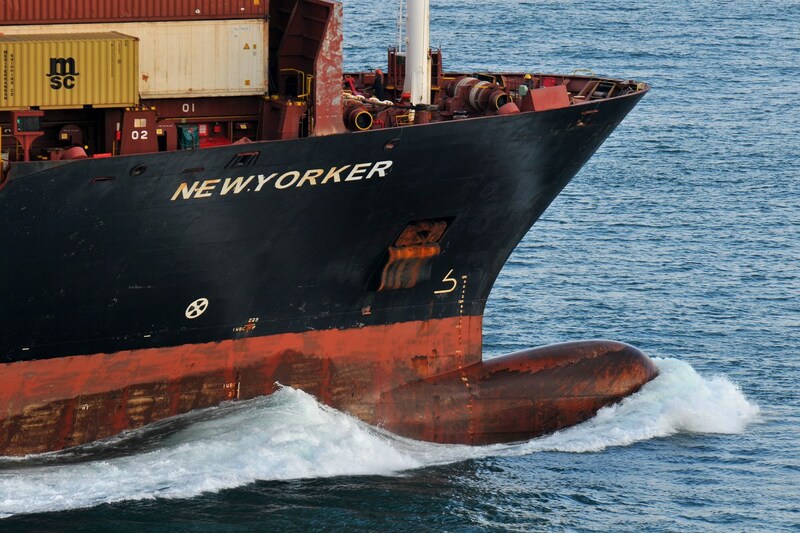 Adjacent vessels –see Great Republic below–likely sustained little or no damage. 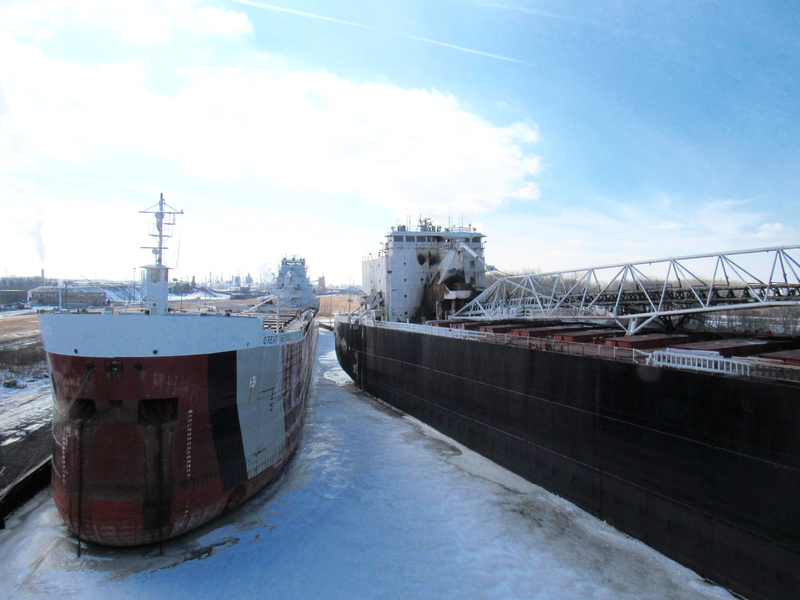 I never got photos of St. Clair underway, but here is a blogpost by a friend Michigan Exposures. To me, besides being tragic, this is a cautionary tale, an illustration of the fire triangle. If you wonder about the value of fire drills, here’s a good reminder of what happens in a fire and what science undergirds fighting one, with analogy provided by Ernest Hemingway. I’ll mostly let the photos speak for themselves. One node of the fire triangle mentioned above is fuel. Given the other two nodes–heat and oxygen, materials not commonly thought of as fuel do burn and fast. Here’s a demo in residential setting, well worth a view . . . how fast a fire spreads in one minute. 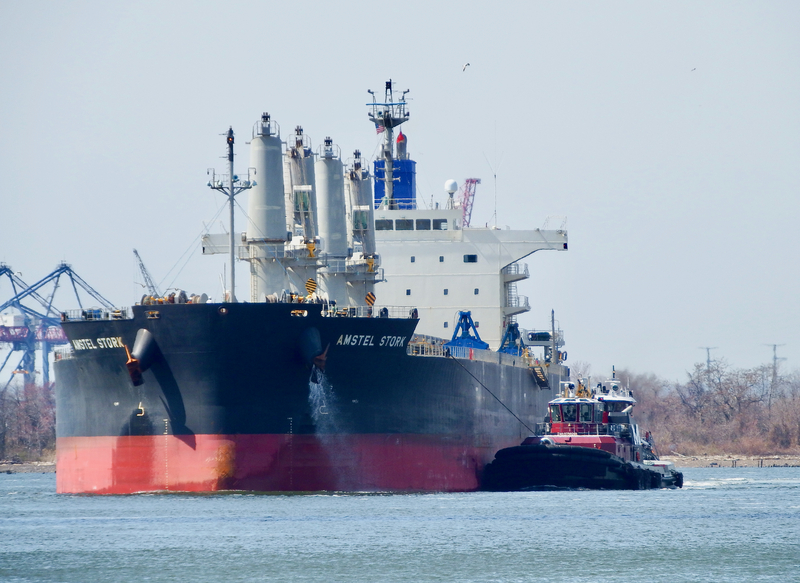 Vessel farthermost ahead is ASC’s John J. Boland, smaller than St. Clair. It looks gutted and heat deformed. 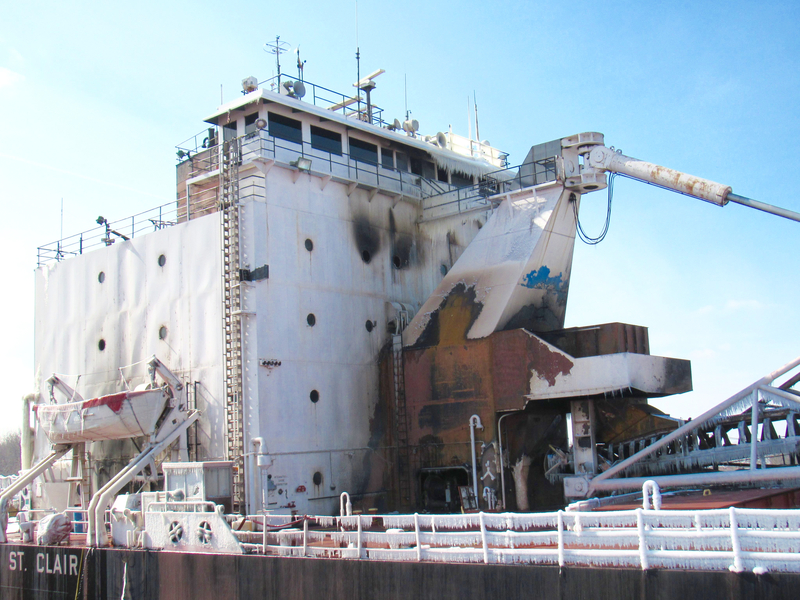 Boatnerd also has reportage on the St Clair fire. There will be followup stories. Many thanks again to Corey Hammond and Tim Hetrick for these photos.